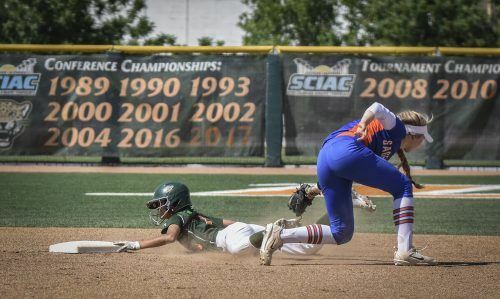 The La Verne softball team broke its three-game winning streak Saturday after losing the second game of a doubleheader to Pomona-Pitzer, 7-5, at Campus West. The loss capped off a blowout weekend; the Leopards swept Cal Lutheran, 3-2 and 7-6, Friday in Thousand Oaks and beat Pomona-Pitzer, 3-2, in the first game Saturday. The loss knocked the Leopards into second place in Southern California Intercollegiate Athletic Conference with a 15-5 record. La Verne trails Pomona-Pitzer by one game for the top spot in conference. Senior pitcher Elisa Ponce kept the Sagehens at bay in game two, only allowing a walk in the first inning and striking out two batters. The game paused in the bottom of the first when senior catcher Angelica DeAngelo took a foul ball into the collar bone. The Leopards put pressure on the Sagehens in the bottom of the first inning. Junior center fielder Carly Condon walked and stole second to get into scoring position. Condon advanced to third off of a fielder’s choice from junior right fielder Sienna Kendricks. With two outs, sophomore first baseman Katheryn Navarro drew a walk and stole second to put runners on second and third for junior designated hitter Melissa Garcia. Garcia was able to reach safely on a fielder’s choice and that scored Condon to give La Verne an early 1-0 lead. Ponce kept pitching strong through the second and did not allow a hit while striking out two of the three batters she faced. She was able to keep Pomona-Pitzer at bay by mixing her pitches and locations. With two outs in the bottom of the second, junior left fielder Rachel Ogata singled and stole second. Condon earned another walk after Ogata and they executed a double steal to both get into scoring position for sophomore shortstop Shelby Tevis. Tevis brought home Ogata and Condon with an RBI single and advanced to second on the throw home to give the Leopards a 3-0 lead. Kendricks extended La Verne’s lead with an RBI single to being in Tevis and make it 4-0. Leading by four runs, the Leopards had control of the game, but that would change in the fourth inning. Ponce gave up a single and a double, followed by a home run from Pomona-Pitzer junior first baseman Liz Rodarte, allowing the Sagehens to get right back into the game, 4-3. Senior pitcher Ashley Caro replaced Ponce in the top of the fifth inning and could not stop the bleeding. After an error, a walk and a single, sophomore shortstop Izzy Deatherage hit a three-run homerun to give the Sagehens their first lead of the game, 7-4. Caro ended up taking the loss after only a third of an inning of work. She was replaced by Ponce, who finished the game for the Leopards. A home run by Navarro in the bottom of the fifth made the score 7-5, but that would be it for the Leopards’ offense as they could not produce any more runs. The Leopards are now 15-5 in the Southern California Intercollegiate Athletic Conference and 20-12 overall with eight conference games left before the SCIAC tournament. 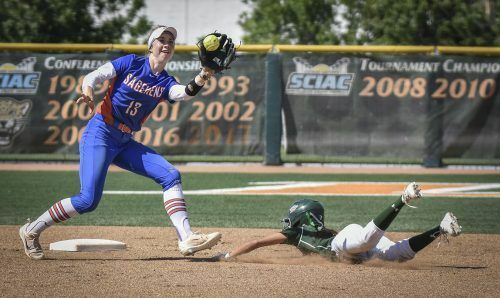 La Verne will face the Occidental Tigers for a doubleheader at 3 p.m. Friday at Campus West. Arturo Gomez Molina can be reached at arturo.gomezmolina@laverne.edu.